This book bundle is perfect for the budget traveler. You will learn how to embrace the luxury of local living and learn the ways of the locals with this budget travel planning book. 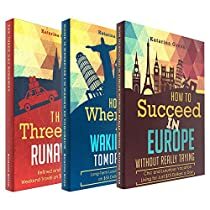 From where to go, where to sleep, how to travel, and what to eat, these books are packed with tips and experiences of how to make comfortable travel work on a shoestring budget. Each piece of planning advice is backed up with a breakdown of costs and daily averages to help you create a budget that is just right for your needs and interests. I have spent my life dreaming of foreign and exotic places. When other kids in elementary school wanted pizza, I wanted Korean food. When friends slept over and wanted to watch Bring it On, I recommended Truffaut. I was playfully pretentious, but mostly just obsessed with the world beyond my own life. Thankfully, a few lucky breaks, lifelong saving strategies, and extensive, creative planning have made it possible for me to explore the distant corners of the globe and start to satisfy my insatiable thirst for travel. I’ve travelled to 25 countries (and still counting) and more cities than I have the time or energy to add up. I’ve had the opportunity to call places as diverse as Paris, Los Angeles, and Athens home, each remarkably different from NY, in whose shadow I spent my childhood. I’ve travelled well, not only far but deeply, meaningfully. I’ve built up international experiences and knowledge not as souvenirs or trinkets, but as the very building blocks that make me who I am. International friendships keep me up to date on the latest and greatest cultural happenings in the world, but my first hand experiences can never be displaced. They’re a part of me. I’ve learned how to fit a happy life into the overhead baggage compartment, and I’ve also learned that with the right attitude, any place can feel like home. How to make travel a priority in your life. How to choose your perfect vacation spot. Which resources and guidebooks to use to pick your ideal destination and plan your trip. How to embrace differences once you arrive and enjoy your trip to the max. How to find gorgeous options for places to rest your head without going over budget. How to embrace local eating culture and have the best meals of your life. When to spend, when to save, and when to splurge on attractions and mementos. How to economise on transportation and experience the rhythm of your destination. How to plan day trips that will improve your understanding of the culture and the region. How to incorporate your experience into your daily life back home. How to do it all for $75 a day!